Spoke with teen about writing and NaNoWriMo. Check out my Instagram for clips from the event! Celebrating B-Fest with fellow YA authors Lucienne Diver, Amy Christine Parker, and Christina Farley! Signing books and chatting with booklovers! 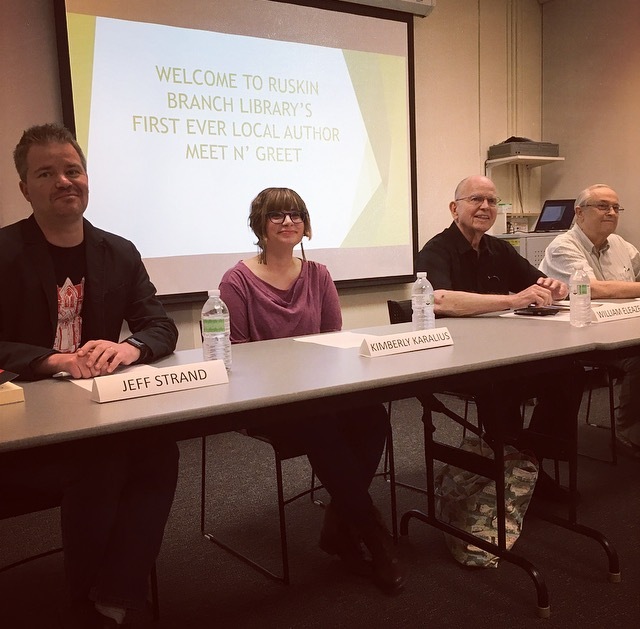 Had a wonderful time talking with locals and answering questions with fellow authors William Eleazer, Jeff Strand, and poet John Foster. My second year at the festival! LOVE CHARMS and my co-panelist's book, AUTOFOCUS, are right next to each other! AUTOFOCUS author Lauren Gibaldi and I had a blast asking each other questions and chatting with the audience. Signing time! We both brought our awesome book swag for our readers. 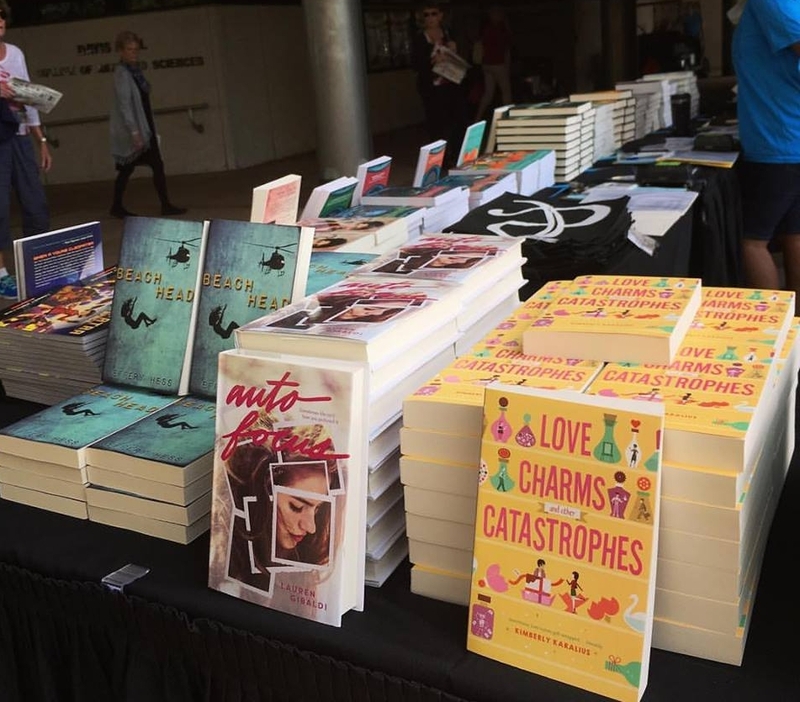 So many local authors came out for B-Fest, B&N's first ever teen book festival! Had so much fun meeting fellow writers and readers who were ready for summer. Just a few leftovers after the event! Both books and Grimbaud swag at the Annual Local Author event! In honor of the new book, I signed with a purple pen. Talking about love fortunes and edit letters at an enchanting art gallery! 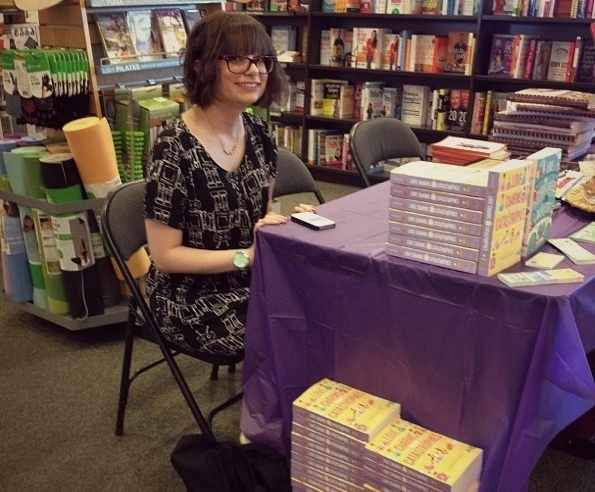 Signing and chatting with local B&N rep, Rachel! My first mall book signing! Had a fun time meeting readers! Books-A-Million's autograph stickers are so shiny they're ghost-like. Hard to capture with a camera. Got my author gear and ready to go! LOVE FORTUNES on sale at the Barnes & Noble booth! I signed the same poster as Judy Blume!!!! Jenn Marie Thorne (THE WRONG SIDE OF RIGHT) and I rocking our YA panel. USF alumni reading with my cohort Phillippe Diederich! Reading from LOVE FORTUNES AND OTHER DISASTERS! Phillippe and I answering some great questions from the audience! Look at this chalk board! The event's about to begin! Love the display. My first local event at the Wesley Chapel Barnes & Noble! Adorable setup, with stacks of Love Fortunes and Other Disasters and a table sprinkled with confetti. Extra books on a table overlooking the first floor. I signed the leftover stock - only eight copies left! 7 Cities, 4 Swoon Authors, Nothing But Fun! Check out my blog for a recap of the tour!